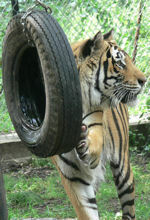 We first heard of Nikolas in 2004 when his owners contacted us asking us if we can take all of their exotic cats because they were wanting to move. We did not have the room for the cats but kept in contact with them for 3 years. Then in May of 2007, they contacted us again saying their home had burned down and they had to evacuate the property leaving Nikolas and a family of cougars unsupervised with no running water or electricity. Although we still did not have the room, we agreed to take the cats hoping we could place some of them in other facilities. The cats’ safety was a big concern. No one wanted Nikolas, whom we wanted to keep anyway, or the entire cougar family, so we kept them all. Nik was very vocal about his uneasiness of being relocated to a new home. He growled, snarled and jumped at anything that moved. 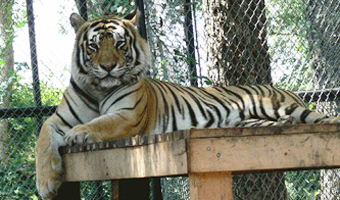 He soon became very comfortable with us and loved his spacious enclosure. He loved going out on the playground, especially if it was muddy. He had a very hearty appetite and especially loved his daily bone we gave him when he came off of the playground. He came to us very thin but quickly filled out to be a beautiful, healthy tiger. He was a very vocal cat and often “talked” loudly for all to hear. He loved getting attention from the volunteers and willingly chuffed and offered his cheek, a sign of acceptance. With heavy hearts we put Nik to rest on September 18, 2009 after a brief battle with cancer.